Elastic diamonds; nanoantennas; better MRI/NMR. A group has developed a way to make elastic diamonds, enabling tiny diamond needles that can flex and stretch. 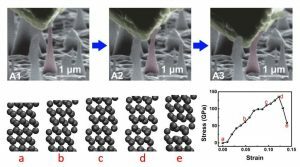 Ulsan National Institute of Science and Technology (UNIST), the Massachusetts Institute of Technology (MIT), the City University of Hong Kong and Nanyang Technological University have developed a process that enables elastic diamonds. Elastic diamonds could one day be used in bioimaging, biosensing, nanomechanical resonators, drug delivery, data storage, optomechanical devices and foldable displays. Diamonds are hard materials with good thermal conductivity, high chemical resistance, and high optical transparency. Diamonds have a stretch limit of well below 1%, according to researchers. Researchers from UNIST and elsewhere, however, have devised nanoscale diamond needle structures that can bend by as much as 9% without breaking. Then, the structures return to their original shape. To develop the technology, the City University of Hong Kong fabricated diamonds on silicon substrates. Diamond thin films were grown using a chemical vapor deposition (CVD) process. Then, the films were etched, thereby forming single-crystalline and polycrystalline diamond needles at around 300nm. Researchers observed the diamond needle structures in a scanning electron microscope. 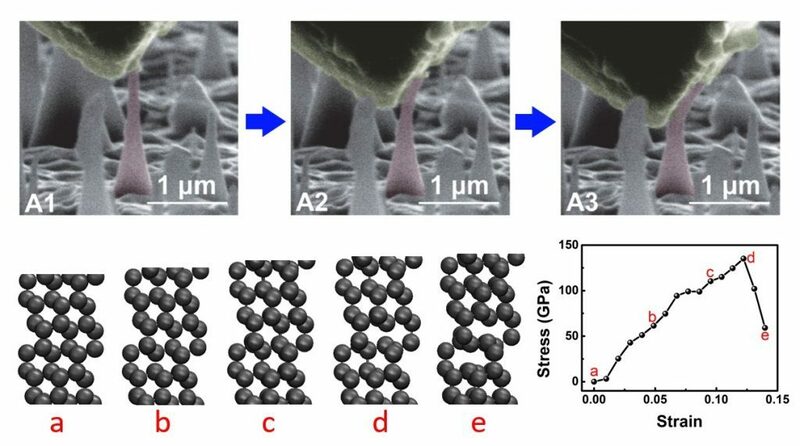 Pressing the needles with a nanoindenter diamond tip, they demonstrated that the structures experience an elastic deformation, with a reversible deformability of up to 9%. ITMO University and the Australian National University have developed a controlled nanodiamond-based light source. 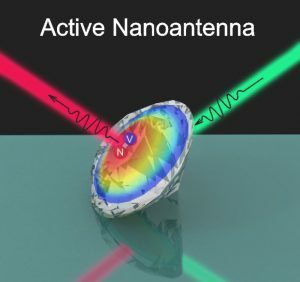 The technology enables a new class of active dielectric nanoantennas based on nanodiamonds, which could be used in the field of nanophotonics. Applications include quantum light sources, bioimaging and information processing. The field of nanophotonics involves the behavior of light at the nanometer scale. Used in biochemistry, electrical engineering and other industries, nanophotonics also involves the interaction of tiny objects with light. Nanophotonics make use of various components to transport light. One such component is a nanoantenna, which is a controlled photonic source. Nanoantennas consist of plasmonic metal nanoparticles. Plasmons are infrared or visible-frequency electromagnetic waves. In nanophotonics, the traditional nanoantennas sometime suffer optical loss and heating issues. One possible alternative is a nanodiamond. Based on carbon nanostructures, nanodiamonds have a high refractive index and good thermal conductivity. For this application, researchers used nanodiamonds with nitrogen-vacancy centers (NV-centers). These are developed by removing carbon atoms in the lattice. Then, the opened vacancy is linked to a nitrogen atom. All told, the NV-centers can be controlled by light. The electron spins of the device, in turn, can be used to record quantum information. Researchers from ITMO and elsewhere found that the optical properties of nanodiamonds can be enhanced. This is done by combining the NV-center luminescence spectrum with optical resonances of diamond nanoparticles. “Usually, to accelerate the radiation, one has to create a complex system of resonators. But we managed to achieve similar results without any additional structures. We proved experimentally that the fading of luminescence can be sped up by at least two times using just simple physics,” said Dmitry Zuev, a researcher from the ITMO. The Department of Energy’s Lawrence Berkeley National Laboratory (Berkeley Lab) and the University of California at Berkeley have developed a way to use tiny diamonds to enhance the sensitivity of magnetic resonance imaging (MRI) and nuclear magnetic resonance (NMR) systems. MRI is used to locate cancerous tumors and other diseases. NMR is used to examine the structure of drug compounds and other molecules. Both systems use costly and bulky superconducting magnets. Looking to eliminate the magnets, researchers have exploited the defects in nanoscale and microscale diamonds for fast biological imaging.